All of the below information comes directly from job reviews written by Fujitsu employees based on 147 reviews. As well as being nominated as one of the Top 100 companies for Graduates to work with the JobCrowd, we’re also number one for IT Support and Telecoms careers and Environmental & Ethical Awareness. At Fujitsu, our unique approach to innovation is centred on people. We are a global ICT company that works with customers on every continent, in every industry. Together, we are empowering people to build a better, more connected society. We are supporting customers on their journey to digital. From increasing efficiency and profitability; through improving customer engagement and enabling new business models; we help them to realise their digital ambitions, and respond effectively to increasing demands from their business, their customers and the market. We respect people regardless of their background, ensuring equal opportunities for everyone. We aim to create an environment where everyone can be themselves and feel able to contribute for the success of the Company. If you are talented, enthusiastic, and keen to make a difference – you can succeed in our organisation. Business Consultancy, Digital, Analytics, Commercial, Finance, Marketing, Sales, Software and Solution Developers, Business Management, Project Management, IT and Technology Architects, IT Operations and Security, HR, Sales & Technology Development, IT and Technology Testing and Procurement. Interesting business as usual work. Lots of room for own research and adhoc work (as long as it's beneficial to the company). Plenty of room for cross-team collaboration. Many projects that are extremely interesting. Work/life balance, salary, very helpful colleagues, opportunities to do charity/social outreach work. Very flexible working arrangements providing the customers needs are being met. Work life balance is very important and Fujitsu let you flex around other commitments providing you are delivering what you said you would, when you said you would. Great colleagues, tonnes of opportunity for development, fantastic pension, diverse range of projects and accounts, positive work environment, supportive supervisors, work flexibility. Good opportunity to learn about areas you want to work in, supportive managment and a constant push to drive yourself. Handed large development project to run from the start including technical development and project deployment. Right from the start I was given responsibility. My manager was happy to let me find my own way of working, guiding and coaching me along the way. Flexible working helps me maintain a work life balance. Great work-life balance and flexible working opportunities. I feel like I really manage my own time, and that good delivery is more important than being in the office 9-5, 5 days a week. I am given the opportunity to study along side gaining on the job experience. There are also a number of people in the office who have completed their studies and therefore can help if I need it. The opportunities! There are opportunities everywhere, if you want to take them. Fujitsu is very focused on allowing its employees (apprentices especially) to learn and progress as far as they can within the business. If you want to learn more about a subject, ask around and you should find someone willing to help you out. The flexibility I'm offered to help me with my work study balance. Also, enjoying software development is a major benefit. Have a multifaceted skill-set not just in cyber-security, coding helps, as does knowledge of other topics as many things collide with cyber-security. If you don't know something, be honest, you're not expected to know everything. Also, don't be overly modest with your accomplishments and interests, you're trying to sell yourself. Mock interviews help if you're unsure about how awesome your projects might seem to others. It also helps to convey your passion for the subject. I would also advise talking about your own personal interests as they are hiring you into a workplace with other people. After all, they are looking for a person that is going to work in a team, not a single-minded machine. Demonstrate customer focus and knowledge of the organisation. Answer questions with examples of specific experiences you have had. Engage with current grads in the role you are applying for to get a better understanding of the job before you apply. Video interview - be yourself and bring some energy when you record your answer. Apply early, be your friendly and genuine self, take time to do yourself justice, emphasise your unique selling points, and don't be perturbed by initial testing phases. Don't be dismayed if other applicants at the assessment centre are from a more technical/IT background - especially in the Project Management field Fujitsu are really seeking candidates with strong communication, are able to organise effectively, have good time management, are self motivated, and are willing to learn. There are people involved in the scheme from a number of different backgrounds, so don't be put off if you think you're degree "isn't relevant", as you'll get enough job training to perform your role! know about SCRUM method, understand the company and its ethical views. I cold called staff via linked in to ask questions and get a feel for the company. Do your homework and try to understand the variety of offerings by the company. No we don't make cameras! Understand the competencies outlined in the job description and get some relatable examples to discuss. Laying things out in the STAR format helps you fully explain yourself. Be sure you understand there will be ample opportunity to train yourself through various courses, but it can sometimes not be busy so expect some good and bad days. Be calm and friendly as the team are exactly that so they'll be looking for a nice person, keep questions short as some answers you get will be too long to remember. Pay attention to spelling and grammar. Use the STAR (Situation, Task, Action, Result) methodology when answering video interview questions. Use recent experiences as examples where ever you can - even if they didn't happen in work, an account of how you dealt with a situation while travelling or in uni will be more effective than talking about being a prefect in junior school. Answer the question asked, not the one you wanted to hear or prepared for. Be prepared for some questions on current affairs - for example, in my 2017 interview I was asked how I thought Brexit might impact Fujitsu's business, as they'd just transitioned to a Europe-wide organisation rather than individual country organisations. Remember that 'winning' any group task is not the goal - what they're looking at is how you interact with other people. Shouting over anyone won't make a good impression. Prepare an interesting fact about yourself to share! Be yourself and relax - if you force a good fit, a few months down the line it might not work any more. Research the company, it's background, potential new clients, vision and objectives and new research and development. Tailor your CV to the role you will be applying for at Fujitsu. Plan out some potential answers for your interviews beforehand and do your research about the organisation. Keep your answers concise - make sure you talk about what you did (avoid "we") in a specific scenario, how your actions yielded a favourable result and how that applies to the job you're applying for. You will mostly be asked competency-based questions so think of a few scenarios that could relate to a number of competencies (e.g. dealing with difficult situations, giving and receiving feedback, working to a tight deadline, etc). Know your stuff. Come prepared with examples to back up every claim you make. Be confident in interviews and focus on your experience so far, using examples of real projects/team work you have participated in. Always ask what the company can offer to you, like why should you take a job at Fujitsu? Get a wide range of skills. The focus is on working well with a team, solving problems innovatively, and demonstrating some level of financial competency/business awareness, so bear these things in mind - research won't help massively. Do plenty of research into the history, ethos and guiding principles of Fujitsu and mention them when appropriate. In particular they love to hear about 'Lean' thinking so do some research into its principles. Be confident, don't be scared to give an opinion. Don't sit quietly in the corner and watch other people contribute. Prepare with good examples of previous environments you've been in but don't be too robotic and scripted, if you are friendly and get to know the interviewer they are probably going to help you more by prompting you and helping to jog your memory of things you've done. If you haven't had previous experience of something then be honest and be keen to learn. They can teach you the skills and seem to mostly be looking for personalities rather than the finished article with all the skillsets. Try not to worry too much about the video interview - everyone finds it a challenging experience. In the interview I was asked 'what would your friends say is bad about you', which caught me slightly off guard. Don't worry too much about the video interview! It's not as scary as it looks! The hardest question I was asked was to think of three areas in which I was in need of development. Don't be worried about not knowing what role/job area you want to go into. Describe an example of how you've managed a budget. Describe an example of how you've changed a process for the better. Go for it! Research the company and the different graduate roles to find the right role for you. Attention to detail and preparation is everything in the interview process. Just be yourself and make sure you are completely prepared with lots of real life examples for the interview and assessment day. For instance Q: When have you shown leadership in a working environment? Make sure you have a real life example as your answer. Be confident even if you don't know the answer, they don't expect you to know everything. Good luck! Do your research on the company-They DO NOT make cameras! Try and identify what skills each question is looking for you to evidence and make sure you highlight this clearly in your response. Set the scene clearly- explain the situation you were in at the time, what the problem was, how you went about resolving it and what skills allowed you to overcome the issue. Then provide a summary of what you've said and what you did. Be yourself-get your personality across as much as you can. You can always be taught a role, or the skills needed to succeed, but the most important thing is showing that you are willing to learn and are determined to succeed. Fujitsu look for Graduates who are team players and are easy to get on with, so try and get this across as much as possible. Focus on how IT affects everyday people, as opposed to the details of the technology. Be sure you're clear on the role before you apply - I thought it would include more maths than it actually does. It also includes a lot of contractual work. This is a great job if you like talking/meeting with new people and dealing with external clients so be prepared to be constantly on the phone to internal clients and also external suppliers - there's no time to be shy. In your application highlight your communication skills - this is key in this role. In this role one of your main roles is communicating with suppliers/fellow employees so be confident in your interview and show you are comfortable when meeting new people. Really know the company you are applying to, and show you are passionate about the industry they are in - I was told this was one of the main reasons I was given the job because I had a lot of knowledge of Fujitsu. Prepare lots of examples you can use for all the standard interview questions, e.g. teamwork, problem solving etc. There's nothing worse than having no answer to a question. Make sure you practice the tests and prepare for the video interviews and assessment centres. Uses specific techniques like S.T.A.R and do your research on the role you are applying for, and any recent business the company has done, in relation to that area. Just keep calm and be prepared, also be yourself, they are looking for someone who they feel fits into their company and who they can build into a future leader. On the day of the assessment centre, don't fixate on things you think you did badly on. The point of an assessment centre is to push you and see how you perform under pressure. There's a range of activities that you'll be asked to complete on the day so if you feel you've done bad on one exercise, you have room to compensate yourself on another task. Fujitsu value these competencies so make sure you have examples of when you have demonstrated these as this could come up in the interview. Have a variety of examples that include previous work experience/ University experience/ general hobbies etc. At the end of your interview, you may have an opportunity to ask the interviewer questions so make sure you have a few prepared to ask them. Be yourself, and prepare well. Know what the role will entail, know what the company does and who its competitors are. Fujitsu hire good candidates, not necessarily those who have extensive knowledge on the company. Make sure you have multiple examples to show off you skills. You will have an online application, online tests, a video interview and an assessment centre. This varies per role but they generally take two from the assessment centre. The assessment centre is split in to three parts and is over half a day. When completing online assessments and video interviews stay calm and don't overthink them. Overthinking what you are going to be asked on something like a video interview can sometimes do more harm than good when a question you weren't expecting is asked and panics you as it wasn't what you were expecting and had practised answers to. Be yourself in any interview you have and don't worry if you haven't answered a question exactly how you would have liked, interviews are sometimes meant to throw curveball questions and see how you react. Research some common questions beforehand but don't put too much pressure on yourself to research every one. It might calm your nerves to look into some commonly asked questions and prepare a loose answer but the chances are they will be completely different! Go into the interview calm and with an open mind. It is a long process but worth the wait. Present yourself honestly and play on your strengths. Be yourself, it is recognised that you are not going to have a lot of experience at this stage of your career, so as long as you draw from your personality and the experience you do have you should do well. What is your biggest area for improvement? Where do you see the UK economy in the next 5 years? Thoroughly research the company, especially the Fujitsu leadership competencies. Each stage of the application is based around them, from the online form to the assessment centre. Fujitsu are looking for graduates with potential- do not spend time worrying that you should be the complete package immediately and show off tons of commercial business knowledge. I had no experience of a business based role whatsoever and this did not put me at a disadvantage at all. All stages of the process are competency based. The questions are evidence/scenario based. For each leadership competency, I would suggest you have a detailed example of a time you PERSONALLY have shown this competency. If you are talking about a team based example, ensure you really make it clear what YOU did to help. Show that you are self aware. You will be asked what you feel you need to work on and develop. If there is something you know you need to improve, do not be afraid to say it. Be prepared to work hard. In a big company HR duties are required in personnel management all over. From advising managers and managing disciplinary in case management to training staff and developing training materials in Learning and development. It can at times be overwhelming but it is never dull. Learn everything about the company and its values. Apply that knowledge when you attend. It will always benefit you. 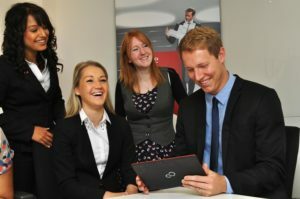 Research Fujitsu - why do you (genuinely) want to work for Fujitsu and within the particular role? Be yourself - it's just as much an opportunity for you to see if you'd fit in, as it is for the interviewer. Take your time with the written questions on your application. I know after application and application, it can become tedious but this is a great grad scheme. Be yourself as personality is key in the day as well as your qualifications and capabilities. Make sure that you research the company well and know what you want to do. I found the best way to prepare for both the telephone interview and assessment day was to know what Fujitsu was about, the awards they have won, the area that you are applying for and most of all why you want to be in that role. Although preparing and knowing as much as you can about Fujitsu is great, make sure you have a couple of questions prepared for the assessors. This shows that your interest goes beyond simply knowing about the company and that you care about the response of people already working within Fujitsu. Relate back to outcomes and customer value when giving examples at assessment/interview. Take your time on your application, ensure you use the STAR framework and to make sure examples used can be verified in telephone and face-to-face interviews. Also try to use a variety of examples when relating to competencies - which will look good when picking out a variety of past experiences (work, charity/volunteering, university learning, exploring new adventures/opportunities). Really be yourself! At the assessment centre it's important to put forward who you really are, rather than what you think the assessor is looking for. This will help to put you at ease and to communicate your past experiences more confidently. Show understanding and interest in the IT sector, Fujitsu's offerings and the function you are applying for. Ask as many questions as possible- obtainable qualifications, the development and career path of the interviewer, what development potential is possible for a Graduate in this area? On the online application provide clear, structured evidence in answer to the questions provided. Don't be afraid to talk openly about your own activity and personal achievements. Practical Security experience? Self Management. Know your strengths and weaknesses and don't be afraid to admit them. Show genuine interest in the company and the role you are applying for. This is a great company to work for and there is the added bonus of the ability to design your career path. Show willing and initiative. Asked to evidence the skills mentioned within the role criteria. Asked how you would deal with certain scenarios. Be well dressed, passionate and show self-motivation alongside any skills the job description looks for. Research the different roles available with the company and try and find out what people actually do. Consider your current skills and experience, and how you can transfer these to a potential role within Fujitsu. Be confident and outgoing, it's all about the people! Triple check spelling and grammar. Tailor your CV to the job role and company. At the top of your CV include a profile, discussing yourself and why you are a good fit for the company. Make sure your personality shines through. When applying for a graduate or placement position, managers understand that you might not have a wealth of IT services experience and knowledge. People hire people, so try and get over the nerves and be yourself. Make sure you have a variety of different examples and experiences to use for the competency interview. Show something different and when you have gone the extra mile always helps! Research about Fujitsu, have questions ready. When answering interview questions, try and take your examples from a lot of different areas such as previous jobs, volunteering, studying towards your degree etc. The feedback I received after my interview concentrated on how the interviewer really liked that I had many different examples to pull from when answering. Quite a lot of standard competency based questions ("an example of a time you had to lead a team") and then further questions from your example given. If applying for grad scheme, apply early! I would advise them to brush up on the background information about the company. Demonstrate where you have proactively taken part in work experience and gained skills that are useful for the job you are applying for. Name a time when you have demonstrated good customer service, name a time when you have exceeded expectations, name a time when you have overcome a challenging situation. Knowledge of Fujitsu and our clients. Presentational skills and data analysis skills are essential in my role so I would advise showing competencies for these. Use a range of examples when answering the questions. I was asked about team work, customer relationships, challenging situations and 3 areas I felt I could develop. Apply as early as possible. Be honest and genuine. Try to stay relaxed when being asked a question and be confident with the answer you are giving. Be prepared for hard and challenging work, that is also very satisfying and motivating. Be willing to learn and continuing to learn. Ask questions, what do you want to know more about? Visit Fujitsu's website and get to know the company so that you know where you're standing. And start learning about IT if you haven't yet! Show you're a proactive person not needing anyone to tell you what the next thing to do is. Fill in the application and tailor your CV to fit the role you are going for. Be prepared for interview/assessment centre and know the business. Be prepared and know the path you want to take at this point. Treat the interview as if it is the only job you want on the planet and be interactive with the assessor. The FJ staff are really sociable and love interviewees who get involved. Application is mainly competency based so make sure you have good examples! Read up on Fujitsu's values. Just be yourself. The interview is a chance for Fujitsu to get to know you. It's not too stressful! Be yourself, be self aware and be confident. Fujitsu doesn't just look at skills and experience but also personality and potential. Take time to think about your answers and relax. Be yourself, research the company really well and act professional. Do not be discouraged by the fact that this job is IT related. Every project in the future will have an element of IT in it so Fujitsu provides a good learning curve so that technical details don't scare you in the future. I would advise for the interview process to be thoughtful of some of the key values that Fujitsu have as part of their mantra. If you can show a real demonstration of times when you have put a customer first for example, this will be well received. Explain a time where you took customer feedback and turned it into an improvement in how you delivered a service. The recruitment process is centered around the candidates' competencies therefore try and ensure you have a range of examples to draw from and that you cover a reasonable range of competencies. Again, the interviews are based around competencies so try and ensure you have examples prepared that will demonstrate your strength in the competencies. One thing that caught me was instead of the standard, "what is your greatest weakness? ", I was asked to list a few examples of areas I could improve. Another thing to bear in mind in an interview for Fujitsu is that Fujitsu in the UK and Ireland mainly provides services and therefore is very customer focused. If you can provide examples to demonstrate your competency in dealing with a 'customer' it is likely to work in your favour. Get in early on the applications and make sure you know what Fujitsu actually do. Do research around your chosen field. And on the day of the interview, just be yourself! And ask questions. I was asked the typical kind of competency questions. Be prepared and try and recall solid examples before you get into the interview. If you have a phone/video interview, practise timing your answers beforehand. It may seem like a long time to answer a question, but you'll surprise yourself at how much you're able to talk about something you did that you're proud of. There will likely be a group project as part of the assessment. Don't be too quiet, but don't be a know-it-all! Neither will get you very far. Try and think outside of the box, make yourself stand out. Research lean (Sense and Respond). Don't be overpowering on group activities... good leaders involve everyone. Ensure that you try and understand fully what you are applying for. This is not a pathway into becoming a lawyer, and although legal degrees are suitable, they are not required. Do not be phased by the "legal" nature of the work - common sense, logic, and understanding of principles will prevail. My French and English degree has not been a hindrance at all. The Interview. Interviews are highly competency based. They draw upon your experiences. They don't all need to be related to the job, so don't start making up corporate scenario or pseudo-legal situations, but be honest. The presentation. Don't be phased by the short timescales, or worry too much about how "pretty" your slides are. Focus on information output and completing your pitch within the time. The group exercise. You are being monitored here as an individual, as well as part of the group. Your only aim is to complete the task, not to be the loudest in the team. Definitely use relevant examples and talk about actual experience from the past that brought in some results. Be concise but specific, it gives it more credibility and you'll stand out from the crowd. All the typical interview questions such as team working, leadership examples, when things don't go as planned, making a tough decision, acting upon something ethically, questioning, persuading etc. Know about the company - its history, its recent changes, and what it is looking to do in the future. See if you can speak to people who already work here (reach out through LinkedIn). Research the company, the company values and the role you are applying for. Try to demonstrate through your C.V. and application form that you have these values and skills. Remember to use a variety of examples in your answers. It doesn't necessarily matter if you don't have specific experience in the area you are applying for, the interviewers are looking for someone who can demonstrate the key transferable skills needed for that particular role. Fujitsu will train you to do the role. Make sure that when answering the application questions you make sure you are aware of the companies values. Being aware of Fujitsu's key values and beliefs will really help you to stand out amongst other applicants. Make sure you answer every question with an example if you can, this shows that what you are saying is true. At the beginning of my interview I was asked if I wanted to look at my CV for guidance, I said no. I think this really helped in my interview as it showed that what I was saying is true. What are your three biggest weaknesses? - When asked this question make sure that despite the fact you are talking about negative things turn it into something positive. Have you ever had to work with someone difficult? How did you handle this? Just be yourself and think about the answers in your application. Make sure that you don't make your answers too wordy! Be yourself and remember to make eye contact! Know the company you are applying for, and make sure you are clear about why you want to work for Fujitsu. For me personally their values and company ethos really stood out from other companies, and whenever asked 'why have you applied to Fujitsu?' I made sure to highlight this, and illustrated how I would fit in well with the companies views. Revise and do your homework beforehand! Know everything you can about the company, research and then research some more. Prepare for the interview and any possible questions that you might expect to be asked. - Take your time, if you rush an application it is obvious. When it comes to your future career, spend all the time you need to perfect your applications! - Do lots of research about what is happening in the industry and company - just show your interviewer that you've made the effort to understand. Make sure you come across as passionate and enthusiastic as to why you would like to work for Fujitsu. Sell yourself make sure you include work experience you have, extra activities and anything else that you feel will make you stand out from the crowd. If Fujitsu go to your university go and talk to the recruiters and ask them what they are looking for. Make sure you do some research on the company and have a think about your personal attributes and a few real word examples you could give for each one. The key is to be confident show conviction in your answers and most of all be yourself. I always feel you are either right for the role or you are not all you can do is your best and what will be will be. Don't worry if you don't have an IT degree or IT experience. 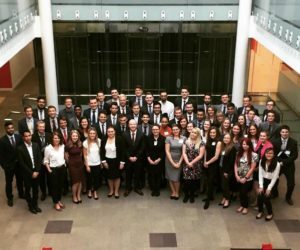 Fujitsu recruits graduates with lots of different degrees - it’s beneficial to the company to have the different perspectives offered by various backgrounds. Be thorough with your answers and make sure you research and understand the Fujitsu core values. Before you go, read up on Fujitsu, what the company does, its values and its recent achievements. At the interview, be honest and true to yourself - Fujitsu will base their decision on your personality, teamwork and how you apply yourself to the tasks as much as on your knowledge and experience. It's OK to be nervous, everyone is in the same boat, just try to relax and enjoy the day. Finally, ask lots of questions and make sure you fully understand the role. Look at the recruitment criteria and identify where your previous experience (through university and wider) fits in well. Identify why you want to work for the company - what it can do for you and what you can do for the company. Be professional and courteous through any interview or assessment centre. Answer with examples and be sure to go into a reasonable level of detail but without repeating yourself. We're big on "continuous improvement" so think of examples where you've raised and owned an improvement to current processes. If you are given materials for a presentation use all of them - even if you think they seem unnecessary/waste of time (e.g. I was complimented on using all the different coloured pens). They want to see what you'll do with what you've got. Get to know the company and industry and show an interest. also have a good understanding of what the role you are applying for. Be personable and friendly to both the assessors and the other candidates you are up against. Fujitsu is a very open and friendly company so having and showing off these interpersonal skills will help. What do you know about Fujitsu and other general competency questions such as dealing with problems, handling a budget, greatest achievement etc. Really research Fujitsu before you apply. Don't assume you know what we do without checking! Give detailed answers and demonstrate why you are passionate about working for us. Be yourself and relax - your interviewer wants you to do well! Keep track of time in the group exercise and the presentation, it will really help you out. Be truthful and show that you understand how you fit into the company. Apply early to try and get into the earlier assessment centres. Be confident in yourself and make sure you demonstrate why you think you would fit in well if you were to join the company. Be yourself and thinking of a range of different examples from your life when answering competency based questions. Show passion, Fujitsu is about the people, you can learn the skills! Once again, passion, show that you want to work there, research the company, find out what they really do. Be youself and let yourself shine! Fujitsu's interview process was the most relaxed interview I attended. They really make you feel at ease, they do not try and trick you and they probe you to get the information they require. It's a really pleasant experience so just be yourself! Research Fujitsu as a company. Try and identify the sectors in which the company operates. Furthermore, identify who Fujitsu's clients are and how we serve them. Have a reason for wanting the role. Don't just apply because "It was my last application" or "I missed deadlines to other schemes". It's not professional. Research the company both prior to your phone interview and assessment centre. There's a lot of information out there, both from sites like this and the Fujitsu website itself. Don't be afraid to ask the recruitment teams questions prior, during and after assessments. They're a great team and extremely helpful. Make sure you're yourself in all stages of the assessment process. They're wanting to hire a person and not someone who can purely follow a script. Let your personality shine out. Show that you have real world experiences and can relate personal situations to the bigger picture. Show significance to what you do and why you do. Take full advantage of Fujitsu's social media. Be it Youtube, twitter or the Facebook graduate recruitment page. There's a lot on there that will help you understand the company, how it operates, what it's values are and where it sees you fitting. Be calm, relaxed and collected. Easier said than done but if you can pull it off, you'll look like natural and ready to be confronted with questions. Remember to be yourself at all times and be honest with your answers. Providing you mean what you say and give justification, no response is too silly. - Be able to demonstrate knowledge of B2B / IT Marketing. - Demonstrate a willingness to learn and 'get stuck in'. Be personable, know your role you are applying to- try to use examples to show you have the right experience for the job or willing to learn- all rounded person. Most importantly, make every effort to understand the Commercial role as NOT a legal role but a business role requiring some legal competence. Also, try to understand the company ethos and whether you really suit it. The online tests are similar to most that are out there, so you can practise these. Numerical, logical reasoning and I think, but might not have, verbal reasoning. First and foremost, for the telephone interviews: KNOW THE COMPANY. Too many people think Fujitsu make cameras. Research, think and take your time to answer the questions. Make sure they are relevant and detailed. In terms of the assessment centres, it is a case of be yourself, make sure you contribute - more so in the team exercise. The A.C is very fair and gives you every opportunity to succeed. You just have to take it. All interview questions are competency based….”can you tell me about a time”. Again, research the role for which you are applying, match these against the job spec, description and key competencies and you will be able to work out some of the questions and prepare answers beforehand. Be yourself - there's 'X' amount of other competent candidates going for a similar role - you need to define yourself and outline your aspirations - be calm and collected when delivering your answer and presenting yourself at all stages of the interview process. Personally I don't think it makes a difference to the question you may be asked on the day - you should prepare your answers to adequately answer any variance of question. There are multiple resources online to help you prepare your structured answering through tools like 'STAR' and 'Top100 interview questions'. Make sure you bring to the table examples of everything you've done, and say how you can apply them to the workplace. Get across your personalty - Fujitsu invest a lot of time and money in their people, thats what makes the organisation so great. Again, get across your personality. Be confident, but not arrogant. Be prepared for banter from the managers who you can laugh with - its not all work and no play! But always remember you are there for 1 reason, work comes first. 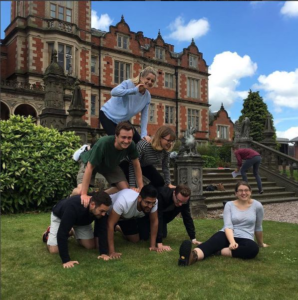 Be very clear about why you would benefit Fujitsu if they employed you: what experience do you have, what knowledge do you have and show that you can easily fit in as part of a team. In the telephone interview, they are looking for clear competencies, have your answers prepared using the STARL technique. Also, do your research: what do Fujitsu do, who are its customers, what is happening in the IT industry as a whole. In the assessment centre, you will have a competency based interview, a presentation exercise based on a case-study you are given and a group task. You are being assessed at all times, keep that and the competencies in mind at all times. Try and be confident - believe in yourself. Don't dominate the group task, ensure you are heard but not letting others speak and putting others down will not be liked by the assesors. Before applying get involved in anything you can, and anything you can afford to give your time to. It isn't just the grades, in fact I would say the more experience and the more projects/opportunities you have got yourself involved in are more important, as this is what sets you apart from the thousands of others who also get good grades. Know the company. Research everything you can and if possible, refer to it when asking questions/presenting anything. Sell yourself as a whole, not just yourself as a graduate of your particular degree. Fujitsu are looking for people with a broad range of skills and experiences, and are therefore very interested in extracurricular details. Demonstrate that you have researched the company, and based on this knowledge emphasise how and why working for Fujitsu is relevant to your career development goals. In your research look beyond Fujitsu's work in IT and into its interaction with society through corporate social responsibility, etc. The application advice is also very relevant here. In your answers, demonstrate that you are passionate about working for Fujitsu by demonstrating an understanding of how working for them furthers your own goals. In your answers to competency questions (e.g. "Give an example of a time when...."), don't just draw on your academic background but give answers that draw on extracurricular experiences, e.g. gap year experiences, situations encountered in sports clubs, etc. Know the company you're applying to; read local news and events regarding the company. Stay calm, try and come up with some good examples before you attend an interview; think of the common things such as team work, finance management etc. Challenge the company. Fujitsu listens to its employees, and your views are valued. Be wanting to make a change for the greater good. Research the company before putting in your initial application - they like to see that you understand what Fujitsu do and are passionate about it! Be yourself and make sure you know your own CV and experience! Get ready to work hard but also understand that the benefits of working at Fujistu are great. Stay calm, answer questions honestly & fight your corner. Do plenty of research into the company. They are not publically known but very big in the world of IT. Also be prepared to put application skills into practice, taking part in interviews and group exercises as well as numeracy and literacy tests. Be yourself. The company is looking for genuine people who get on well with others. Ask plenty of questions and be enthusiastic. Competency based questions based on previous work life experience. Things like working in teams to complete tasks. A couple of questions to throw you as well, like what have been your most challenging experiences or similar. Be ready to take a moment to think carefully and give your best answer. Not just the first thing that comes to mind. Do plenty of research into the company, and why you've applied for your particular role. Have plenty of case studies for work qualities such as team work you have done and leadership roles etc. The process is fairly short really and you hear back quickly. Research the company and prepare for every stage. Think about different scenarios you have experienced, both positive and negative and look at how you performed well and where you could have done better. Be calm but also yourself. The company wants personality not just someone who ticks some academic and professional boxes. Be prepared, be friendly at the assessment centre at all times, even to the other candiates. Think before you answer a question, it doesn't have to be the first thing you think of. Make sure you use examples and concepts from outside of work or schooling. We are a company that really engages with its employees, so being able to give examples of what you do outside of the avergae schooling day will really help show you off. Similar to above but just make sure you are yourself and don't overanalyse or think anything, have your prep sheet created long before your interview and really show off why you would be a great asset to Fujitsu. Apply as early as possible to be in a with a good chance and do your research on the company and any products/projects they may be doing (check newspaper articles, tech blogs, etc.). One question I was asked was: "Demonstrate ways in which you save money"
Fujitsu highly values attitude, probably as much or more than knowledge because the knowledge can be taught. The company also values individuality and so show your true yourself, be hard working, and be a team player and you'll do fine. Be professional but be yourself and show your personality. Draw on real experiences you have had over theoretical things. Make sure you talk about the result you brought about otherwise you are just telling a story about the situation. Evidence your day-to-day skills/abilities. Whilst a background in the specific area is useful, it's not a write-off if you don't have specific knowledge relating to the scheme. Show that you are a team player, a logical thinker, a nice approachable person and a hard worker. Don't just focus on academic achievements for this, use your extra-curricular experiences too. Same as application advice. Show that you're a good person to work with and a willing learner. Be confident and work well in the team excercise. Guide, don't command..
Don't think of getting this job as the last hurdle. Remember to talk about what happens after that, with your continued development and future prospects. Remember you are assessed from the minute you walk through the door, so be polite and friendly to everyone you meet. Best IT graduate scheme available from feedback across friends/peers. Research, and have relevant examples that aren't all from group work at university. As per most Graduate applications, take your time to do the initial application and do think hard about what you want to do and why. Prepare for competency based questions. Be genuine; skills can be taught but personality is unique . Research! Use the competencies that are on the Fujitsu website, these are key aspects of what the company looks for. Do practice online tests so you get used to the style. Again, use the Fujitsu competencies; these are the most important tools. Use lots of examples in your answers to show your versatility. Be yourself! As with many things, you get out what you put in. Many companies will brag about opportunities, but having worked for several large ones before, this is the only company where if you want to take a hold of a project or step up your responsibilities or work load, there is always a chance to. 'The work is there if you want it' is the phrase an old Fujitsu graduate passed on to me, so I would reiterate that and say go for it and get stuck in! Do reserch on Fujitsu as they are not a consumer brand, understand (as much as possible) what they do and how they benefit customers on the population of the UK. Make sure you research the role you are applying for, and most importantly, make sure it is a job you actually want! Research the company before your phone interview, and make sure you draw from different experiences. Talk about uni work, paid work, interests and any volunteering you may have done. If you get to an assessment centre, be assertive but not domineering towards the other candidates and assessors. Be yourself and look at the website and other information on the company to understand what is important to the business. Lots of competency based questions, be prepared and make sure that you are being yourself. If you are relaxed and speak up then you will show the interviewers, who will notice what you have to offer. Gain some knowledge around what Fujitsu UK&I do and how it varies across its other sectors across the world. Research into what offerings Fujitsu provide and who the competitors are. Need to be a candidate that fits the criteria, this does not only include good results and knowledge, but also includes other skills like volunteering and being a team player etc. When asked to answer questions, always try to plan the answer so that it has an Introduction, the main point, and a conclusion. Stay precise to the point. An example of a complex project that you have led that required you to analyse the situation, determine key priorities and produce a plan? Describe an occasion when you went out of your way to satisfy or exceed someone else’s expectations? Describe a situation of when you have influenced someone more senior or experienced than yourself where they initially disagreed with your viewpoint? In the early stages of your application, ensure you research the company thoroughly. It's also really important that you tell us in your initial application why this company's the one for you and, concurrently, why we should recruit you ahead of the competition. The application also requires you to sit online tests and it's essential that you've practiced these online beforehand. There are a few sites out there that allow you to take mock tests for free so do take advantage of them. Again and as with all interviews, preparation is key. Having a good raft of information about the company and the role for which you're applying will be a great asset, as will the ability to answer the questions asked of you with solid examples from your experiences in work and education. Essentially, you should think about the key skills and competencies that you've already acquired in advance of the interview so they're at the forefront of your mind,should you be asked a question that relates to them. The soft skills are very important. You need to be able to demonstrate that you'll fit in well with a team, communicate effectively and have an eye for the detail. Academics alone will get you nowhere you need to have achieved outside of University. Research the company first. It may not be what you think it is. make sure you know what Fujitsu does and why you want to work in the IT industry. Discuss what you find interesting. Come across as a 'Team Player'. Give detailed and honest answers. Don't think that you have to have conquered the world to qualify for a job. Just be able to demonstrate that you have skills which will serve you well in the work place without exaggerating. Learn about the company before you apply or have an interview, show that you're interested in the work they do and demonstrate what you feel you can contribute to the company. I cannot overstate the importance of soft skills and evidencing them. Be yourself - what I got from the assessments is that they're looking for something in you as a person, regardless of your experience/role you're applying for. Try and relax, the interview process is long but each stage isn't as bad as you expect it to be! Where are my opportunities of growth? Be ready for a challenge. Be a team player. Be yourself. Have good examples of competency based questions and allow plenty of time to get the application done as early as possible. Applications still need to be processed so you want to be at the front of the queue. Don't try to be someone you think Fujitsu wants, but aim to demonstrate all of your personal skills, best attributes and relevant experience in the various situations you might be asked. If what you demonstrate matches with what Fujitsu want, then Fujitsu could be right for you. If it doesn't match then it's not a problem because another company may be a better fit for you, so don't be disappointed. If you have good communication skills, enjoy working in a team and have drive and determination you will really enjoy working at Fujitsu. Just be yourself and be positive. Get your application in early. Its a comprehensive application process, and its always good to have a job offer as soon as possible. Its a long day at interview stage, so be prepared for this. Make sure you really sell yourself in your interview, right from the moment you walk through the door. Some questions are quite tough, you may not have come accross something they are asking you, but just remember to adapt another situation to suit your needs. Even if its not really the same scenario, talk about it as it might demonstrate some attributes we are looking for. Research into the company and just be friendly and confident. Lots of competency based questions, just have various examples of good work that you have done prepared that you could apply to different scenarios. Always ensuring to highlight relevant skills. Look carefully at the different graduate streams to decide which one suits you the best, then when you get to your interview you will be genuinely enthusiastic about the role. Research the company as a whole and the CSR initiatives they are involved in. Look for recent news items about Fujitsu to make your knowledge up to date. Be yourself and don't try to put on a fake persona at the assessment centre. It is a company full of warm people so just try to relax and be yourself! Try and think your previous experiences at University and Internships/Work Expereience and think about what skills you have gained from these. Have relevant examples for competency based questions, use the STAR format, as you should for any interview. Be confident, and prepared to think on your feet. Fujitsu is a great company, very diverse in lots of locations; there's a variety of roles and the people are genuinely willing to help you. Be yourself; skills you can learn, but attitude is unique to you. Many opportunities for training and personal development. Given the size of the enterprise many things tend to move slowly. The flat hierarchy structure, and the friendliness of the staff. Incredibly poor line and capability management, especially for graduates. Grads are promised the world and then dumped in a role. This role may be significantly too difficult or significantly below their capability. They are then ignored by the grad scheme unless it is a 'day out'. Supportive, industry leader, care about employees, care about diversity, care about sustainability, offer excellent training, offer excellent pension, offer excellent salary, listen to less senior members of staff. As in most large companies - some beaurocracy. - Ask pages very helpful and speedy when you have a HR or IT problem. Very ethical, emphasis on customers and people. sometimes they make business decisions I do not understand the viability of. "The Process" to achieve results becomes frustrating. During the graduate programme your performance is assessed every 6 months and you get a pay rise in line with this. It's a well-structured way of rewarding effort and helping you feel like you're progressing, even though you're still on the scheme. It's a big, corporate company, so there's a lot of process to anything. Culture and the people you work with - dedicated and motivated! New organisational restructure change can be demotivating. Large company so its easy to sometimes get a little lost in the shuffle if you dont find your place straight away. Work life balance: As a company, Fujitsu encourages a healthy work life balance. Provided I have fulfilled my commitments, I am usually out of the office in good time, and have the flexibility to work from home regularly. Personal Development: There doesn't appear a great deal of focus on developing employees outside of their immediate role. Personal development is generally self-driven. Fujitsu runs some really interesting and innovative projects, and the Fujitsu way make it a company that you can be proud to work for. Considering it's an IT company, it seems very behind on innovations and communications methods to be used internally. Flexibility - work when you want, where you want. Entrust graduates with meaningful work. Not as customer facing as I expected- this could be specific to my role at the moment however. International company with lots of opportunity. No-one knows who you work for and think you work for the camera company Fujifilm. It's a global brand, and therefore presents great opportunities to interact with foreign colleagues, and potentially travel abroad in the future. The company is going through a period of change, and this has caused some uncertainty in some areas. Focus on work/life balance. Expected to work hard whilst at work but also have the time to relax as well. The company has a huge global presence - with headquarters in Japan. So will likely be the opportunity to travel - the Procurement graduate from a previous year as already travelled to Spain with work. It's in one of the biggest industries - IT. I've learnt quite a bit about IT since being here even though my role isn't technical. It invests a lot in training/development. I have already started studying for Procurement exams where I'll receive a recognised Procurement qualification. I feel the management structure isn't the strongest - I find it hard to get any guidance/advice on my career going forward. I felt the company was unprepared for new graduates. My first 2/3 months were boring at Fujitsu and I didn't have much to get on with at all. It has now picked up since my third month here. Unfortunately redundancies were announced earlier last year within the company which could make you feel uneasy and put you off applying for the scheme here at Fujitsu. However, this shouldn't be the case as Fujitsu are expanding in other new business areas and that's why grads are needed- to being in new knowledge and ways of working. The culture and people, there are lots of people who want to help you to succeed and lots of opportunities to do this. Some parts of the business need to join up better - this is something that I believe will improve in the next few months. Very invested in the development of graduates. Offer flexible working. Grad Focus. There are always graduate opportunities. if you like to get involved then there's a lot of opportunities to do so. Very encouraging of career progression and value input and taking the initiative irrespective of your level. It's a big company so will take a little longer to get to know everyone, but with a variety of projects it's not an issue!